Pocket gophers are burrowing rodents that live underground almost all the time. They are so named because of their large external fur-lined cheek pouches, one on either side of the head. These pouches or “pockets” are used for carrying food. They are well equipped for a digging, tunneling lifestyle with powerfully built forequarters, large-clawed front paws, fine short fur that doesn’t cake in wet soils, small eyes and small external ears, and highly sensitive facial whiskers to assist movements in the dark. An unusual adaptation is the gopher’s lips, which can be closed behind the four large incisor teeth to keep dirt out of its mouth when it is using its teeth for digging. Mounds of fresh soil are the best sign of gopher presence. Mounds are formed as the gopher digs its tunnel and pushes the loose dirt to the surface. Typically mounds are crescent- or horseshoe-shaped when viewed from above. The hole, which is off to one side of the mound, is usually plugged. Mole mounds are sometimes mistaken for gopher mounds. Mole mounds, however, appear circular and have a plug in the middle that may not be distinct; in profile they are volcano-shaped. Unlike gophers, moles commonly burrow just beneath the surface, leaving a raised ridge to mark their path. One gopher may create several mounds in a day. In nonirrigated areas, mound building is most pronounced during spring or fall when the soil is moist and easy to dig. In irrigated areas such as lawns, flower beds, and gardens, digging conditions are usually optimal year round and mounds can appear at any time. In snowy regions, gophers create burrows in the snow, resulting in long, earthen cores on the surface when the snow melts. Gophers feed on roots, stems, and leaves. They prefer forbs over grasses, but they will eat both. Some preferred forbs include alfalfa, dandelion, and prickly pear cactus. They generally will move out of fields that are tilled annually because such places lack sufficient food. Losses caused by gophers typically involve damage to or destruction of plants. Forage crops, such as alfalfa, can sustain heavy damage because of gopher feeding and mound-building. A single gopher moving down a garden row can inflict considerable damage in a very short time. Gophers also gnaw and damage plastic water lines and lawn sprinkler systems. Their tunnels can divert and carry off irrigation water and lead to soil erosion. Mounds on lawns interfere with mowing equipment and ruin the aesthetics of well-kept turfgrass. “Tubes” of soil laying above ground after the snow melts. Pocket gophers are active all year long. When snow is present they will tunnel in the snow. Soil from below ground burrowing is pushed up under the snow. When the snow melts, the soil cast (tubes) that are left behind provide evidence of their winter burrowing activities. From the makers of Kaput Mole Gel Bait, we are happy to bring you Kaput Gopher Bait. This grain based product, has an EPA general use label for use against pocket gophers. 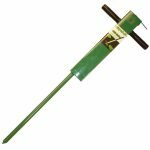 Proven effective in laboratory and field tests in controlling damage caused by pocket gopher infestations. With Kaput-D, simply probe a hole to intersect the pocket gopher tunnel. Then, slowly pour one half cup of bait into the tunnel and close the hole carefully. The pocket gopher should be eliminated within a week. 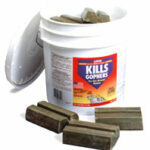 Kaput Gopher Bait Applicator be used to easily apply gopher bait to the subsoil. Simply push the tip of the probe into the tunnel, turn the lever and your bait is applied. Seal the hole with a wad of newspaper and your done! Note: This applicator is designed for use with small grain baits such as Kaput Gopher Bait. To successfully control gophers, the sooner you detect their presence and take control measures, the better. J.T. 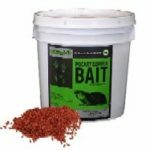 Eaton’s Gopher Bait are an excellent choice. Note– This product can only be sold west of the Mississippi River. Successful trapping or baiting depends on accurately locating the gopher’s main burrow. To locate the burrow, you need to use a gopher probe. Probes are commercially available or can be constructed from a pipe and metal rod. An enlarged tip that is wider than the shaft of the probe is an important design feature that increases the ease of locating burrows. Probes made from dowels or sticks may work in soft soil, but are difficult to use in hard or dry soils. First, locate areas of recent gopher activity based on fresh mounds with dark, moist soil. Fresh mounds that are visible above ground are the plugged openings of lateral tunnels. The main burrow can be found by probing about 8 to 12 inches from the plug side of the mound; it is usually located 6 to 12 inches deep. When the probe penetrates the gopher’s burrow, there will be a sudden, noticeable drop of about 2 inches. You may have to probe repeatedly to locate the gopher’s main burrow, but your skill will improve with experience. Because lateral tunnels may not be revisited by the gopher, trapping and baiting in them is not as successful as in the main burrow. The key to an effective baiting program is bait placement. Always place pocket gopher bait in the main underground tunnel, not the lateral tunnels. After locating the main gopher burrow with a probe, enlarge the opening by rotating the probe. Following label directions, place the bait carefully in the opening, taking care not to spill any on the ground surface. After placing the bait in the main burrow, close the probe hole with crumpled up newspaper, or some other material to exclude light and prevent dirt from falling on the bait. Several bait placements within a burrow system will increase success. Tamp down existing mounds so you can distinguish new activity. If new mounds appear for more than 7 to 10 days after baits have been used, you will need to rebait. Once pocket gophers have been controlled, monitor the area on a regular basis for reinfestation of the land. Level all existing mounds after the control program and clean away weeds and garden debris so fresh mounds can be seen easily. It is important to check regularly for reinfestation because pocket gophers may move in from other areas and damage can reoccur within a short time. If your property borders wildlands, vacant lots, or other areas that serve as a source of gophers, you can expect gophers to reinvade regularly. 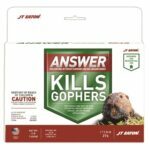 Be prepared to take immediate control action when they do; it is easier, cheaper, and less time-consuming to control one or two gophers than to wait until the population builds up to the point where the gophers are causing excessive damage.